Lizards are a widespread group of squamate reptiles, with approximately 6,000 species, ranging across all continents except Antarctica, as well as most oceanic island chains. The group, traditionally recognized as the suborder Lacertilia, is defined as all extant members of the Lepidosauria (reptiles with overlapping scales) that are neither sphenodonts (i.e., tuatara) nor snakes – they form an evolutionary grade. While the snakes are recognized as falling phylogenetically within the Toxicofera clade from which they evolved, the sphenodonts are the sister group to the squamates, the larger monophyletic group, which includes both the lizards and the snakes. 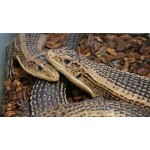 Lizards typically have feet and external ears, while snakes lack both of these characteristics. However, because they are defined negatively as excluding snakes, lizards have no unique distinguishing characteristic as a group. Lizards and snakes share a movable quadrate bone, distinguishing them from the sphenodonts, which have more primitive and solid diapsid skulls. Many lizards can detach their tails to escape from predators, an act called autotomy. Vision, including color vision, is particularly well developed in most lizards, and most communicate with body language or bright colors on their bodies, as well as with pheromones. Lizards are the most speciose among extant reptiles, comprising about 60% of all living species. 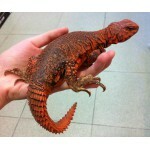 Ornate spiny-tailed lizard (Uromastyx ornata) Kingdom Animalia Phylum&nbs..
Sudan plated lizard (Gerrhosaurus major), also known as the Western plated lizard, great plated liza..